There is joy in making delicate terracotta jewellery or ceramic utility pots. Though pottery is a profession for a few, it is more often one of the most enjoyable hobbies today. “You can be an adult and still play with clay”, says Pavan Sathya of gopni.com who is in his mid 30’s. Gopni.com is an organisation for pottery enthusiasts, which conducts pottery and ceramic art classes as well as provides firing and kiln support and related activities. Sathya, who has been a professional potter for over 4 years says it a viable profession provided you have the right contacts and creativity. He also conducts pottery classes in Jeevan Bhima Nagar. Sathya studied painting before getting into pottery. You can procure the clay from Pottery Town or places in Peenya or even some upmarket studios. Depending on the type of clay one orders, it could already be refined or powdered. This is preferable else your articles may have slight lumps in them. If the clay is not very refined, one could sieve the chunks before laying it on a wheel. The processed ball of clay is then laid on the wheel and pots of various shapes and sizes are churned out. The cost of the wheel is the most expensive part of pursuing pottery as a hobby, says Sathya. It can cost about Rs 10000 for an electric wheel or Rs 4000 for a traditional one. Before the moulded article is removed from the wheel, many patterns and designs can be struck on the article using design files. Design files are slender knives- something like nail files, which when touched on a rotating pot leaves patterns on the pots. The article is then dried under the sun and thereafter fired in a kiln. Sandhya who is the owner of the studio, Claytons has set up kilns at her home in JP Nagar. Many people like to paint their pieces also but the organic natural look is also preferred. For Priyanka, a chemist and an educationist working with children, pottery was a childhood dream. “Plunging your hands in clay for the first time over a rotating wheel is the most exciting bit of making pots. Whatever comes out of it is secondary,” says Priyanka. She adds she was always thrilled to see professionals at Choki Dani (Jaipur) and Shilpagram (Udaipur) making beautiful shapes from a ball of clay. Priyanka, who is from Rajasthan has taken a course with gopni.com and is attending her second session. For advanced students, form improvement is essential and this is also taught at most pottery classes. Val Mindel who is from the US has been a potter for many years now. She too takes classes with Sathya. 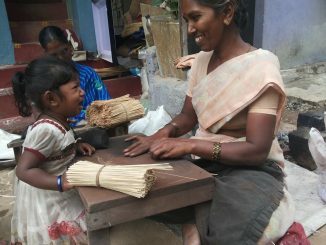 She says her mother is a professional potter and she joined pottery classes to improve her form. She has created art and pots in India, US and Japan and feels that equipment and technique-wise, the practices here are as good as any other countries. My first experience with pottery began at this place called Pottery Town, three months ago. The locality is full of pottery shops on the main roads with the potters’ homes adjoining the shops. There are also many potteries where the mass produced pots and decorative pieces are manufactured. Suresh from Pottery town making clay diyas. Pic: Deepti Sarma. For someone like me who always thought pottery is an expensive hobby to pursue or that it was meant only for the elite in upmarket hobby classes, this was quite a contrast. This place is simple and yet so appealing. People here are quite warm and absolutely artistic. The life-like painting of their favourite Tamil Icon Rajinikant spoke greatly about their creativity and passion. I visited Pottery Town on one late Sunday morning. The potters were busy laying out the clay. I was quite charmed by this small shop at the corner of the main square in Pottery Town called Suresh Pots. I met the owner, Suresh who had just begun to run his potter’s wheel. And within seconds when the kneaded clay was thrown on the wheel, Suresh’s skill just brought out various shapes and contours of pots. There were hundreds of pots of various sizes and shapes around the shop. Some with decorations and some plain. From Diwali diyas to vases and curd pots he created these articles effortlessly and I was simply amazed. I finally decided to try my hand at pottery and Suresh was quite encouraging. As I sat facing the rotating wheel, I immediately realised that it was certainly not as easy as he had made it look. But like most people, I got immense pleasure out of playing with the soft clay and finally got to make my own vase after many attempts. I also made a tiny diya with some pretty strokes of design on it, and felt very accomplished. The best time to visit Pottery Town is mornings. This place is definitely worth a visit. Batches of utility pots seen in plenty add to the morning glory of Pottery Town. Pic: Deepti Sarma. Suresh like others in Pottery Town has been a potter all his life. And this is a profession passed down from generations. There are about 42 families that live in Pottery Town today. The residents are the fifth generation potters from Tamil Nadu and are whole sale providers for curd pots, biryani pots, vases, diyas and fancy decorative items which are either sold or rented for events like weddings, functions etc. At the modest outlet of Creative Clay in Pottery Town, one finds several ingenious designer items, mouldings, customised show pieces etc. Rajshekar of Creative Clay is one of the successful potters of Pottery Town. He is a busy man and gets many orders for tailor-made pieces. But not many families today want to continue with pottery as it is not very viable for them as a profession and there is little support from the government. Their younger generation is now opting out of this profession. A NGO called Head Stream recently provided a fund of Rs 1 lakh to the Pottery Association in Pottery Town, and if all goes as planned, Pottery Town will soon have a retail outlet for their items. The utility items available in Pottery Town cost between Rs 2 to Rs 10 in wholesale. The decorative pieces cost between Rs 150 and Rs 3000. Basics of pottery: Pavan Sathya teaching Priyanka pot making techniques, Van Delmil is also seen. Pic: Deepti Sharma. Why do the items cost higher in a design studio than in Pottery Town? It is because of the firing and finish, says Sandhya who has been a potter for 13 years now. She says even though her art pieces are priced more than those at Pottery Town, she is sometimes forced to sell them at a lower price as the general mindset is that the items are made of clay and hence, shouldn’t cost much. She has a studio at her place and a few items displayed there. Sandhya regularly hold exhibitions at Chitra Kala Parishad, Safina Plaza etc. She also organises pottery classes at her place for 10-12 days in a month. She makes customised articles and decorative pieces. She also specialises in terracotta jewellery. One part of pottery classes is about understanding usage of the wheel and the other part is creating items without the wheel. This could be terracotta jewellery or ceramic items. Both are taught at different stages in the classes depending on your inclination. If you are unable to buy expensive equipment like the wheel or kiln, you could use the equipments from the studios but that purely depends on the consent of the owner. But today there are some studios which allow you to create your personal work using their equipment. Gopni.com is one such studio. These days, pottery is encouraged in schools as well as it has its bearings in science and art says Sathya who conducts one day sessions at schools on request. Apart from being organic and a lot of fun, pottery provides great satisfaction to one’s creative side. There are many who make many utility and decorative items for their home through clay. Pottery is quite popular as a summer course amidst children as well. Centres like “Claystation”, Koramangla holds regular pottery classes. Another place Doodleden is a colourful peppy activity centre in Curley Street for children and adults alike. They are a walk-in ceramic studio where art enthusiasts get to paint ceramic pots and create their own master pieces. They also have a cosy corner for making pots using an electric wheel. Sounds fun? It is! This place is a brain child of Kavita Mudappa who is a home-maker and was keen on having a safe fun activity centre for kids to do unusual stuff says Amrutha Bhushan who currently manages this place. The colouring material is provided and there is also support staff for assistance and guidance, be it painting the pot or making it. The painted ceramic article would then need about 10-15 days of drying and blasting for the finishing and utility or decoration. If taking regular pottery classes is not your cup of tea, places like Doodleden and Claytopia have in-house potters who help you to create your pot and take it with you instantly in one session. These are priced around Rs 100 for three pieces. Indira Nagar based Claytopia also has a bistro so you can eat while you paint. Started four-years-ago, this place is currently managed by Zalmon Maikho. As I happened to visit the bistro during a birthday celebrations which included children painting various articles like ceramic bugs, mugs, magnets and so on. Raghav B Sastry, all of 11 years old was also one of the invitees. Raghav loves to paint and got to paint a mug here. Like Claytopia, Doodleden also organises parties with creative activities. There are many different sides to pottery and ceramic art. But one aspect which is most essential is the experience that many look for. This experience is a lot different in many upmarket pottery studios as compared to the modest shops in Pottery Town. But finally what matters is creativity and the passion to acquire the skills. And the pleasure of creating something from a lump of clay! In this edition, we start a new series, Insights into Bengaluru, with an indepth story on the financial issues of the urban poor. Read about the newly elected women corporators to the BBMP council and the latest happening on the Agara-Bellandur SEZ front. Check out our features on the Feed Your Neighbour initiative, and about one of Bengaluru’s forgotten architects, Otto Koenigsberger. I, along with my 5 yr old daughter are now attending classes at Gopni by Pavan Sathya. I am enjoying every bit of it. It was a pleasant surprise to see this article on Pavan Sathya in Citizen Matters.